Mussaurus was a herbivore (plant-eater) that lived in Argentina during Triassic period, around about 215 million years ago. Mussaurus is known only from fossilized eggs and infant skeletons, which are about 8 to 15 inches (20 to 37 centimeters) long, but adults are believed to have grown to about 10 feet (3 meters) in length and weighed around 150 pounds (70 kilograms). The infant skeletons that have been found, have very unusual proportions (including short snouts and large eyes) compared to an adult prosauropod, however it is known that they are definitely prosauropods from the examination of pelvic and limb bones. 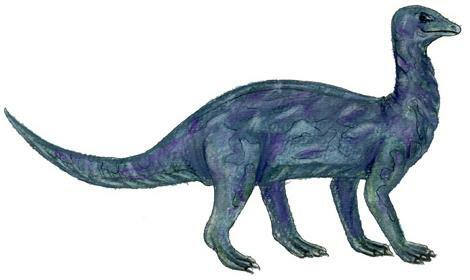 Although no adult fossils of Mussaurus have yet been found, it is believed that its proportions would be closer to those typical for prosauropods. The name "Mussaurus" means "mouse lizard", and could be said to be something of a misnomer, given the adults were not unusually small. South American Dinosaurs - Mussaurus lived in southern Argentina. Mussaurus was a genus of dinosaur. Mussaurus was a member of the Saurischia ("lizard-hipped") order of dinosaurs. What this means, is that although Mussaurus was not closely related to lizards, it did have similarly shaped pelvic bones. Mussaurus was a Prosauropod - a member of a group of related early herbivorous (plant-eating) dinosaurs which had long necks, small heads, shorter forelimbs than hind limbs, and a thumb claw. Mussaurus lived about 215 million years ago, during the Triassic period. Mussaurus lived in southern Argentina. Mussaurus was a herbivore (plant-eater). Mussaurus was about 10 feet (3 meters) long. Mussaurus weighed about 150 pounds (70 kilograms). 【SAFE & DURABLE】- Made of PVC (neither too hard nor too soft) eco-friendly materials, odorless and non toxic, drop-resistant, safe and durable for kids to play with. Stuffed with PP cotton,the mosasaurus figure body is squeezable that it won't hurt your kids. You can twist the jaw, the teeth, the toe and play it roughly without worry! Kids' safety always comes first. ASTM/EN71/CPSIA/CE certification approved. 【PERFECT COLLECTION GIFT FOR DINOSAUR FANCIER】1:40 hand paint, exact details make you feel the charm of Jurassic Period! Exquisite design and hand paint process, make it historically realistic. It can be great Birthday or Christmas gift for both children and adults. To collector this dinosaur would be a special display model, also great decoration in the room or office. 【RECUR - EXTRA 6 MONTHS WARRANTY】100% brand new and worry free purchase. If you had any problem about our products, just contact with us via Amazon message, we'll serve you till satisfied. We're direct manufacturer that narrow the distance between customers and factory. Our products are divided into 4 series, prehistoric dinosaur animals, marine creatures, wild and farm animals. Welcome to our store for more exploration! RECUR---Know the world better by having it! 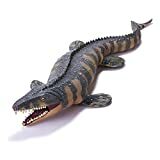 The Mosasaurus toy from Recur is exactly what you need for children ages 3+.With it, you could spend a joyful time with your kids, telling them amazing stories of the past on earth. Recur seeks to develop children's understanding of nature and life, "Quality, Safety, Love, Nature and Happiness" is our design idea. Recur has developed 4 series of more than 100 products: Dinosaurs, Wild Animals, Sea Animals and Farm Animals. Mosasaurus, the colossal swimming creature.Mosasaurus features authentic textured skin, realistic sculpting and articulation that makes this colossal creature come to life! Amazing Action Figures for Dinosaur Toys! 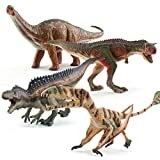 16.14" soft Hand-Painted jurassic dinosaur toys with teeth realistic design animal figure, vivid 1:40 scaled model featuring authentic detail, makes you feel the charm of Jurassic Period. With it, you could spend a joyful time with your kids .Edutainment, maintain our kids curiosity and teach them through lively activities,enhance their imaginative play. ❤Perfect STEM Educational Toys: Take the animal dinosaur figures home, let your kids really touch and feel the dinosaurs, but not just limit to books films or dinosaurs theme park. Not only a great opportunity to teach them about hero complex and prehistory science story, but good for stimulate kids' creativity and let their imagination run wild with prehistoric dinosaur action figure toy set. ❤Safe and Sound Dinosaurs Toys: Made of durable and safety vinyl plastic material ,dinosaur figures is non-toxic and BPA free with US TOY Safety Standards ASTM F963 certificated. 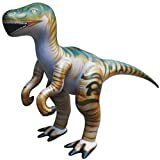 Adopting professional eco-friendly spray paint with three times hand painting, making a realistic looking dinosaur model set. Strong enough to withstand hours of rugged play. Everyone has a dream about dinosaur, not only kids but even adults! Choosing the best and most popular dinosaur toys for kids is not really easy.Unleash this dinosaurs action figure Pack Playset in your home and watch your kids go wild. JamBer animal figures sets certain to be your child's most loved dinosaur toy. What Determined the Top Dinosaur Toys in Our List? 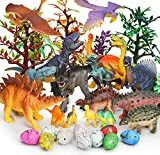 -This fun dinosaur gift set comes with 17 plastic dinosaurs in different colors.100% Safe for toddlers,making them the best gifts fora happy birthday present! -These cute educational dinosaur toy set is great for little guys and girls to get started learning about prehistoric times. -Give your child the biggest boost to their imaginatively play time with this super interactive and cool dinos toys. A good way to help get kids interested in learning science as well as enhance hand eye coordination,creativity, problem solving,motor skills, and cognitive abilities, especially communication skills. -Adhering to strict US toy safety standards ASTM F963 certificated. - Constructed from kid friendly plastic (BPA lead, and phthalate free 100% non-toxic). - Sturdy enough to stand on its own two legs with no choking hazard. -With thrice hand painted, features all the cool realistic details and colors of the prehistoric age. -Perfect for kids of all ages from toddler to preschoolers and up. 5 Dinosaurs including: a Triceratops, a Baby Diplodocus, a Diplodocus and a Rex Tyrannosaurus! QUALITY - Made of high quality ABS-plastic, CE and EN 71 certified. Hours of CREATIVE Play - The best way of adding additional animals! Ideal for extending your set and having a lot of fun. Let your child's imagination run wild! The best way of adding Petting dinosaur Dinos to you Duplo collection! Ideal for extending your set and having a lot of fun. Let your child's imagination run wild! Affordable, top quality, all Aliris products are built to premium standards. Made of high-quality ABS-plastic, CE and EN 71 certified. Compatible with Duplo. The product is manufactured and sold by Aliris. The prehistoric Jurassic figures are compatible with any other Duplo Set, including the Duplo sets: Duplo Farm Animals 10870, Farm Adventures 10869, Family Pets 10838, Farm Nursery 5646, Big Farm 10525, DUPLO Birthday Party 10832, My First Number Train 10847, Town Farm Pony Stable 10868, Horse Stable 10500, My First Animal 10863, Preschool 10833, Town Pizzeria 10834, Around The World 10805, Big Fair 10840, Carousel 10845, Photo Safari 6156, Park Forest 10584, Zoo Bus Safari 10502, Baby Animals 10801, Forest Animals 10582, Jurassic World Gentle Giants Petting Zoo 10879, Big City Zoo 5635, My First Zoo 6136, Farmyard Ranch 10522, Jurassic World 10880, My First Farm 10617, Duplo Jungle 10804 and others. Get ready for thrilling action and adventure with Jurassic World! Play out all the exciting battle action inspired by the film with these Battle Damage figures! 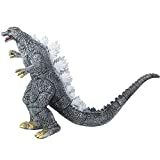 Includes a Tyrannosaurus Rex figure with Battle Damage decoration and one Monolophosaurus figure with a spring-action feature that reveals battle damage. Both dinosaur figures have articulation, authentic sculpting and decoration. And, by pressing a button on Battle Damage Tyrannosaurus Rex, her HUGE bite is unleashed! Run now! With rich details: sharp teeth, curly tail and hard scales. Helps improve children's hand-eye coordination when children are playing with this toy. It helps develop child's mind, creativity and thinking ability. The figure is exquisite in painting details and posture which contributes to lifelike characteristic. It is great for pretend play and encourages children to develop their imagination. To provide a safe toy for your kid, we adopt non-toxic and eco-friendly material. Exquisite craftsmanship and sturdy material ensure these figures will serve for a long time. It is not only a great toy for kids, but also a nice decoration in the room. 練 CUDDLY & CUTE - Give your little one a new companion to love with this adorable plush dinosaur. Allow your child's imagination to fly as his or her new buddy takes him or her back to the Jurassic era. 練 100% SAFE & CHILD-FRIENDLY- Your child deserves the best, and this authentic dinosaur toy is just that. Made from durable materials, it is soft and non-toxic. It is also free of choking hazards. 練 A GIFT FOR ANY OCCASION - Adorable and huggable, this plush dino surely is a gift for all ages. Whether they be a dinosaur lover or not, these cute companions will truly impress! A stuffed dinosaur may not be the first thing that comes to mind when looking for a toy to give to your little one. But... a dinosaur toy is educational - it takes one back to prehistoric times. It also sparks questions like, "Why did they become extinct?" and "Could they really fly?" These alone ignite and fuel curiosity in a child - which is a good thing! A child is always curious, always asking. With the right toys and the right "buddies," his or her understanding of the world can expand. Gone are the days of teddy bears and stuffed bunnies. 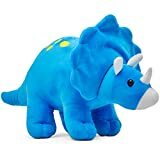 Say hello to your child's new Plush Dinosaur! ✅ Easy to store and small enough to bring outdoors. ✅ Made from washable materials. ✅ Perfect gift for young and old alike. After all, how can one resist this adorable companion? Take your little explorer back to the prehistoric era! Add Plush Creations's wild dinosaur to your cart TODAY! 【Features】:Hand painted and not -fading, Solid and look real, texture clear, has a very real touch of convex and concave. 【Large Sizes】:Average Size 11 Inch. Pterodactyl is Over 13 Inches Long. 【Safety】:The toys do not smell and made from non-toxic,high quality environmental protection material conform to ASTM,EN71,6P test standards. ☞Carnotaurus is a large carnivorous dinosaur. Because there are two tentacles on the top of the head,so called Carnotaurus. The Carnotaurus is a high-speed predator who is good at running.It is the fastest dinosaur known to run at speeds of up to 60 kilometers per hour. It is also known as the Cretaceous cheetah. ☞Brachiosaurus is one of the largest animals ever to live on land and one of the most famous dinosaurs. A giant herbivorous dinosaur in the late Jurassic period.A 25-meter-long adult brachiosaurus can lift his head 13 meters above the ground, equivalent to the height of four floors. ☞Pterodactyl is a pterosaur in the late Jurassic period. It is a small-toothed insectivore that belongs to the early dragons. It is characterized by a light skull . ☞Acrocanthosaurus is a large bipedal dinosaur that is good at capturing sauropods from 30 to 40 tons. It has long spinous processes on the neck, back and tail. ☞ Hand Painted with Full Details.Perfect in every way! Detailed characteristics in each one! ☞ No smell,non-toxic,high quality environmental protection. let kids play safely. ☞ Conform to ASTM,EN71,6P test standards. If for any reason, your purchase requires service or you have questions, you can contact Amazon directly for a replacement or refund, or contact EAHUMM by clicking "Sold by EAHUMM Corporation"
and then clicking on the "Ask A Question" button for helpful and friendly customer service!